How to Make Kefir Strawberry Popsicles Recipe. 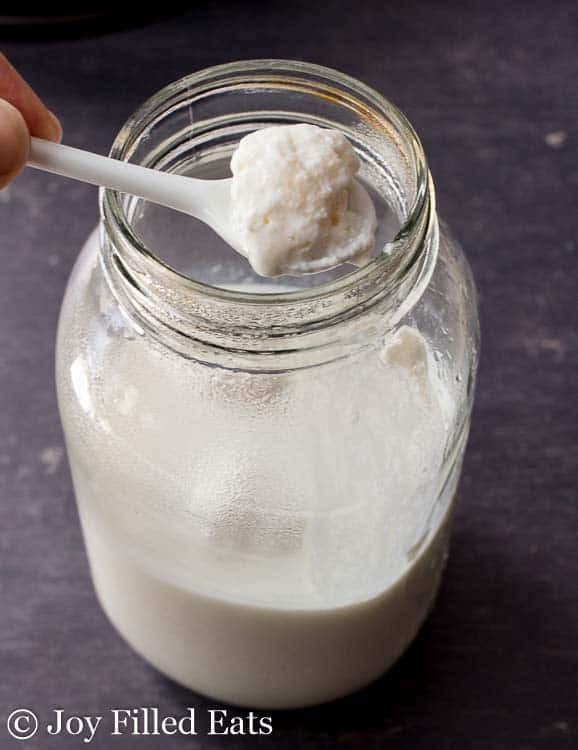 Making kefir at home is easier than you think. 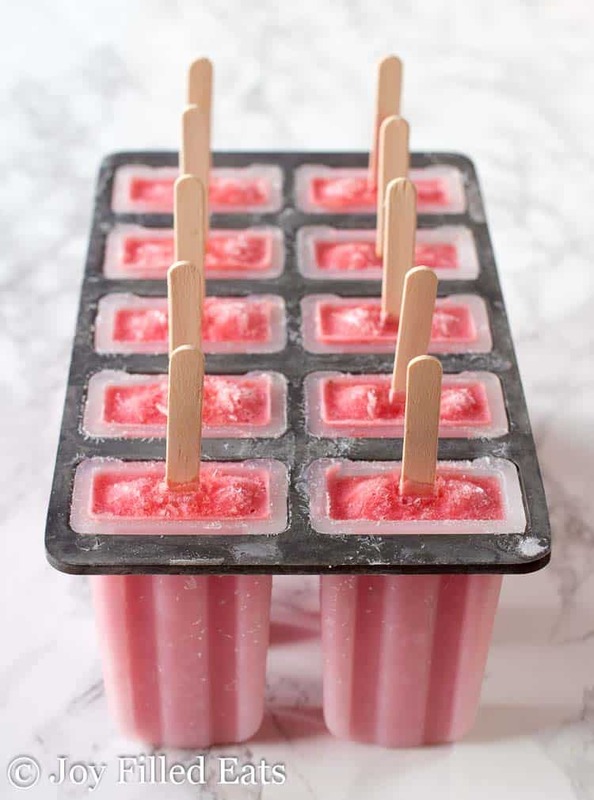 With just a minute or two of work each day you can serve your family this nutritious beverage or make it into fabulous strawberry popsicles. Recently I brought dinner to friends who just welcomed their 7th baby. 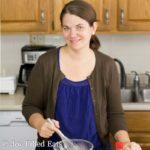 When I walked into their kitchen to drop off the food I saw the husband doing something with a jar of thick creamy liquid. I thought he was making fresh mozzarella so I asked. He was actually making kefir cheese. I was intrigued. Since kefir has grown in popularity so much lately I’ve been curious but I’ve never tried making it. A couple of weeks later their son walked into my house for a playdate holding a jar for me of milk with “kefir grains” written on the top. Cue frantic googling trying to figure out what on earth to do next. It ended up being much easier than I thought to make kefir! Kefir is fermented milk. It is similar to yogurt in taste. But kefir has even more strains of bacteria making it a rich source of probiotics. What is a kefir grain? This little chunky thing on the spoon is a kefir grain. It is a combination of yeast and bacteria. Kind of weird, right? Being new to this whole kefir thing I’m still not sure I’m crunchy enough for this. But, my kids have been drinking it in smoothies and eating it in ice pops daily. It is much cheaper and easier than buying or making yogurt and has a lot of the same health benefits. Add a spoonful of kefir grains to a clean jar. Add milk. Let sit at room temperature until it thickens and the whey starts to separate. Transfer the grains to a new clean jar. Add more milk. Let sit at room temperature until it thickens and the whey starts to separate. Repeat. After you remove the grains from the kefir you can use it right away or refrigerate for later. Our typical smoothie is so simple I didn’t want to post a recipe for it. I’m sure it is also similar to a typical smoothie in your home. Toss a couple ripe bananas in the blender. Add some liquid. Add some frozen berries. Hit the on button. The liquid lately has been kefir with a splash of OJ. Perfect for growing children. 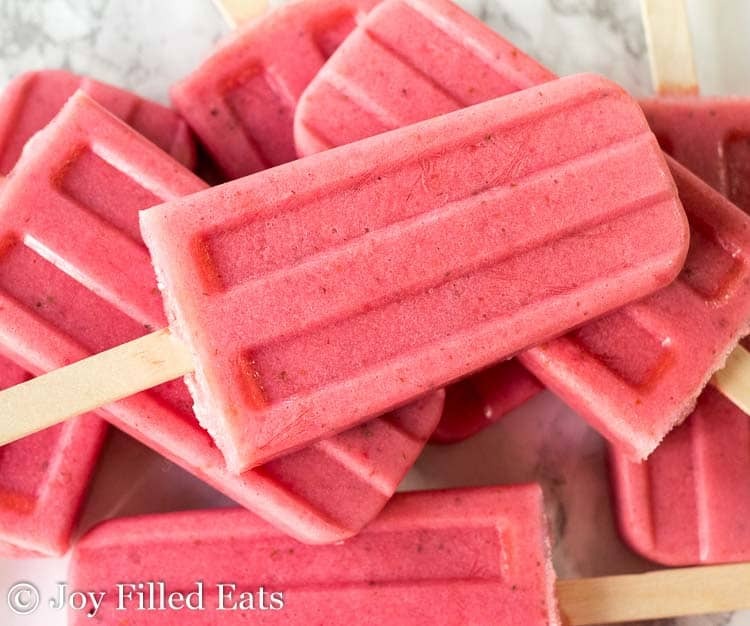 My Strawberry Popsicles Recipe with Kefir is just as simple but it took a little tweaking to get that perfect creamy popsicle texture that is still soft enough to bite a chunk out of. Fresh Strawberries + homemade Kefir + a little bit Sweetener. Much healthier than any store bought ice pop I’ve ever seen. And my kids gobble them up. I love the ice pop maker you see in my photos but it does take up quite a bit of freezer space. 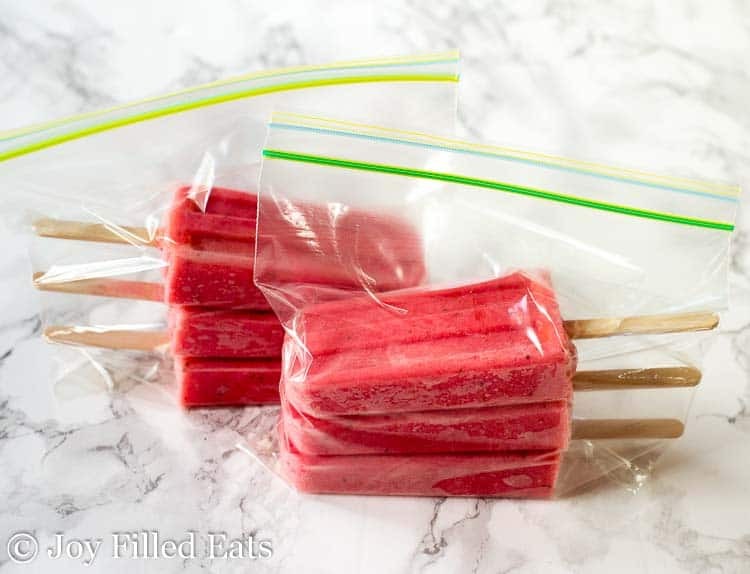 Once our pops are frozen I like to pop them out and store the strawberry popsicles in plastic sandwich bags. It’s easier for the kids to serve themselves this way as well. 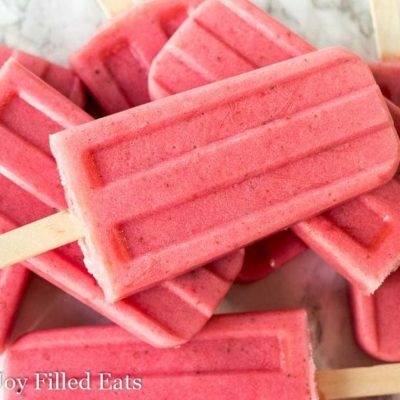 How to Make Kefir Strawberry Popsicles Recipe. Making kefir is easier than you think. 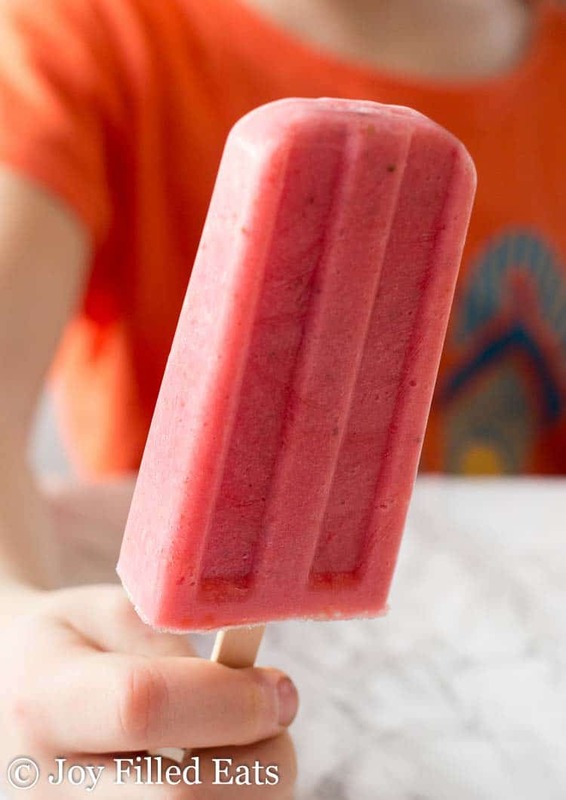 You can serve this nutritious beverage or make strawberry popsicles. Combine the ingredients in a blender. Blend until smooth. 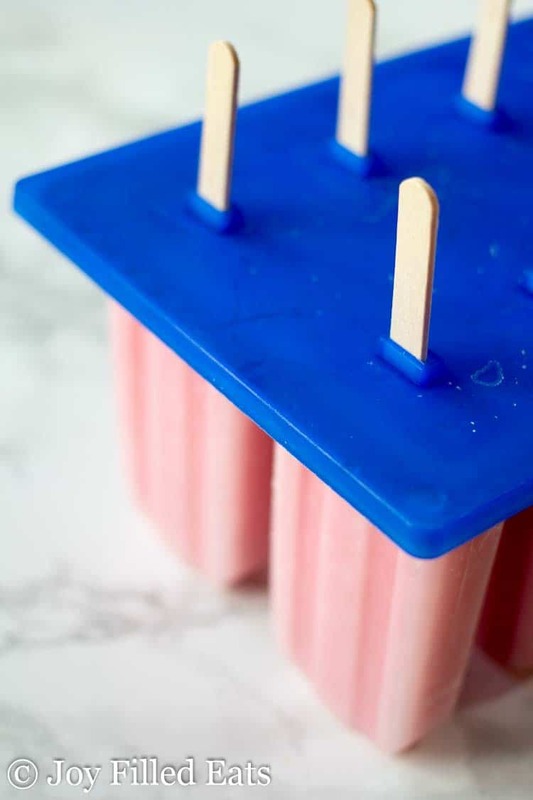 Pour into popsicle molds and freeze until firm. Can I use store bought kefir? And do you double ferment your kefir for this recipe? Yes. And no. I just fermented it once.